This story opens on Jason Rusch (half of the New 52 Firestorm) waking up in a black void. 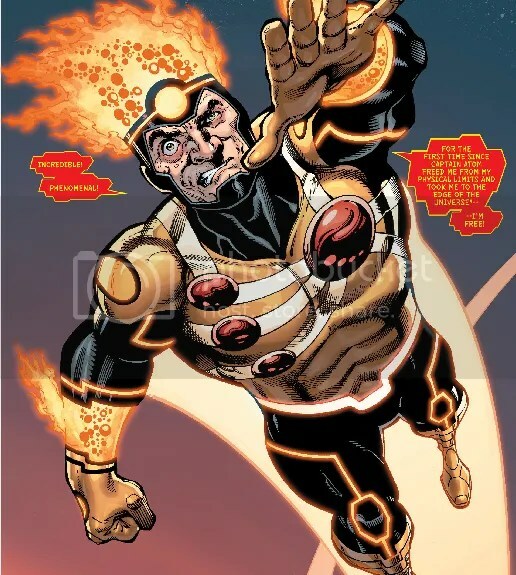 He is in the Firestorm matrix, and should be able to see whatever Firestorm sees. The last thing he remembers is Firestorm being pulled inside the Dataxen robot in The Fury of Firestorm: The Nuclear Man #14. Jason calls out to Ronnie Raymond, who controls the Firestorm body, then realizes he is not alone. Ronnie is in the matrix with him. The boys quickly realize a third party is controlling Firestorm. It is Dr. Megala who has taken over Firestorm. 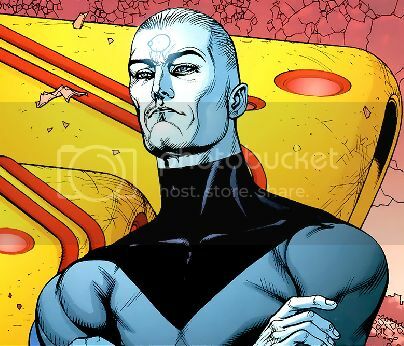 Ever since he was briefly freed from his wheelchair in Captain Atom#12, he has longed for more power. Back at the Continuum, Dr. Megala’s team isn’t sure what he hopes to gain from this takeover. Scott Alexander says, “He’s spent years imprisoned in a wheelchair. For him, this is about freedom.” Which is pretty much what I just said, but maybe most Firestorm readers didn’t follow the Captain Atom series (and shame on them). Megalastorm flies to South Dakota and changes the faces on Mt. Rushmore to Galileo, Newton, Einstein, and himself. 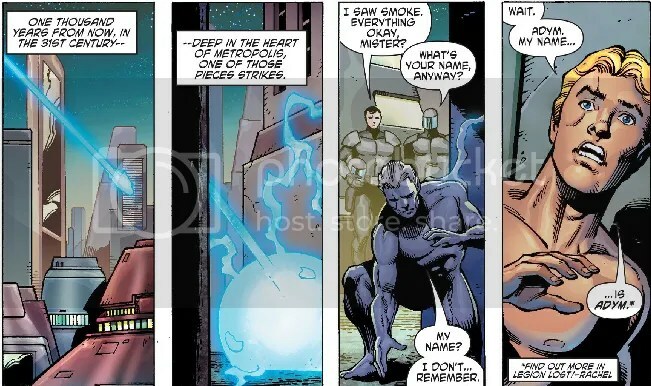 Inside Firestorm’s head, Jason figures there must be a way for him and Ronnie to push Megala out. Captain Atom says he was far away but the multiple Firestorms and their activities drew him back (see The Fury of Firestorm: The Nuclear Men #1-12). With the news that Mt. Rushmore has been defaced and now includes Dr. Megala, Captain Atom realizes Firestorm is now under Megala’s control. Meanwhile, Qurac launches a nuclear missile. Megalastorm turns it into a giant Rubik’s Cube while Ronnie desperately tries to get Megala’s attention. 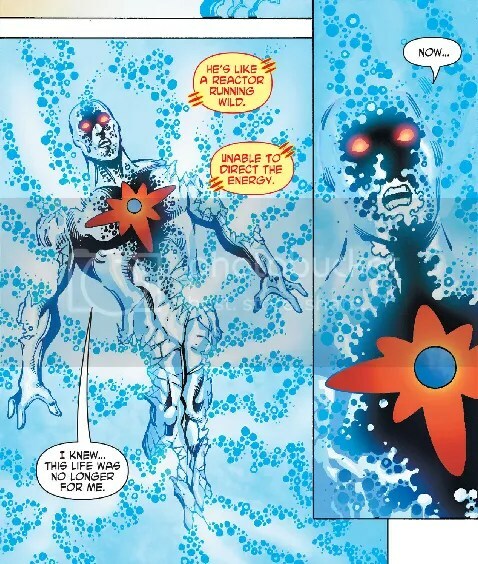 Back at the Continuum, Scott is surprised by the sudden appearance of Captain Atom. He finds Megala’s inert body and says he knows what must be done. He instantly zaps himself to Megalastorm’s location over Bikini Atoll. He smacks Megalastorm and has a brief discussion with him. He actually lectures Megala. He tells Megala that he will become the monster he was afraid Cap would become. Megalastorm is not pleased. Megalastorm trash talks Nate as he blasts him. Inside his heads, the boys can feel Firestorm firing off a tremendous amount of energy. Megala believes he’s killed Atom, but Cap reappears behind him and reaches through his chest. Nate reckons that, like himself, Megala has trouble maintaining his form while under a great deal of stress. Megalastorm goes nearly critical, creating a tsunami that almost capsizes the Independence. At this point, Ronnie and Jason manage to make contact. Megala does his best to ignore them, and contacts the Continuum. His cohorts send the Dataxen droid out to assist Megalastorm against Captain Atom. Megalastorm blasts Cap with enough power to obliterate a city. Nate says no one man should have that much power. He says when he realized that about himself, he left the planet. The boys feel Megala’s hold weaken further as Cap blasts Megalastorm again. Megalastorm shrugs the blast off. He and Captain Atom both charge up and then begin to fly toward each other at top speed. At this point, the boys pull Megala’s conscience into the Firestorm matrix. Back at the Continuum, his body begins to seize. Scott tries to pull him back into his body as Ronnie decks the old man. This leaves Megala’s body comatose. Ronnie takes control of Firestorm. 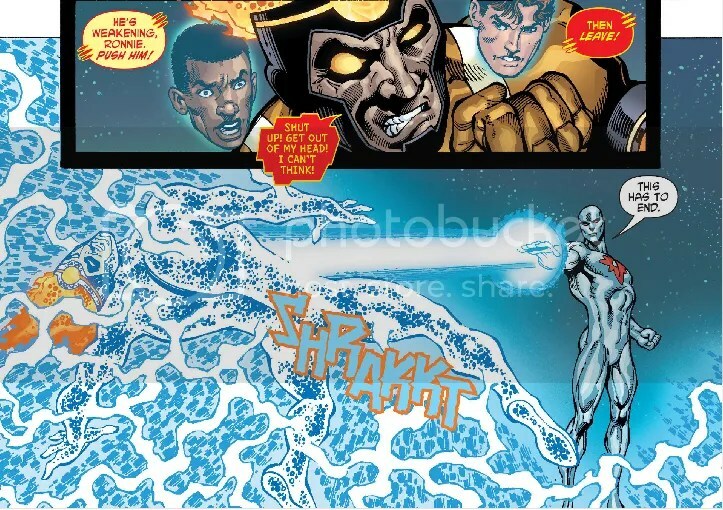 Firestorm calls out to Captain Atom, convincing him Megala is gone. But Cap has built up too much speed and can’t pull up in time. He crashes into Firestorm. When they collide, Cap absorbs as much of the energy as he can. It is too much for him to handle. He begins to break up. Fragments of Cap spread out across the time stream as he comes apart. He appears to be disintegrating across time and space. One shard of his body finds itself in 31st century Metropolis, where is seems to take the form of a man. Back in the present, Firestorm passes out and plummets into the ocean. I absolutely love Dan Jurgens. I enjoyed his run(s) on Booster Gold and Superman. He is a great artist and everything I read that he’s written is thoroughly enjoyable. This is no exception. I’m bummed that Captain Atom was essentially killed off in this issue, but I know how comics work and I’m sure we haven’t seen the last of him. Dan was taking Firestorm in a whole new direction, and it would have been awesome to see where he went next, but five issues after this, the series was cancelled. I give this one a B+.